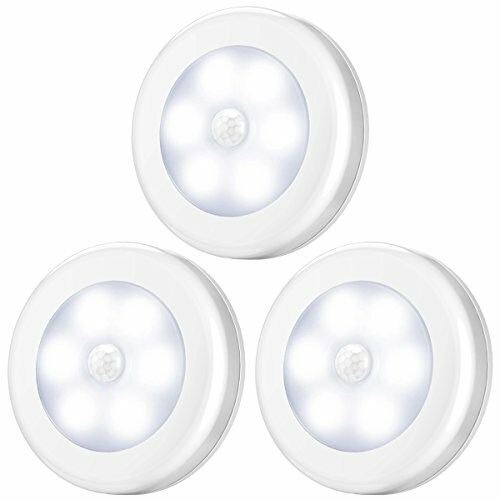 Amir Motion Sensor Lights act like little “guardians”, provide automated, hands-free way to protect your homes indoors and outdoors. Light up your bedroom, stairs, hallway, closet, or entryway to your home where the light switch is just too far from the door. Don't leave lights on needlessly running up the electric bill. With easy installation, it mounts in seconds. No hammers, drills, or tools required. Simply use the double-sided adhesive pads or stick to any metal surface with the built-in magnet. 1. Please kindly check whether the batteries have been installed in the correct direction. 2. This light can only be turned on in darkness environment. The light won't turn on if the light sensor has been detected by the enough light. 3. If you use Alkaline battery first and then change to zinc-manganese dry battery, the lights might not work as the zinc-manganese dry battery is shorter than the Alkaline battery. 4. The sensor light might not work if you use the infrared heater in winter. The infrared will cause failure of the sensor. However, the light will get back to work in 30 minutes after turning off the heater. Note: This light can only be turned on in darkness environment. It won't turn on if the light sensor has been detected by the enough light. And Please DO NOT install this light in high temperature place, otherwise, high temperatures will affect the adhesive strip, and then the light will slide easily! !